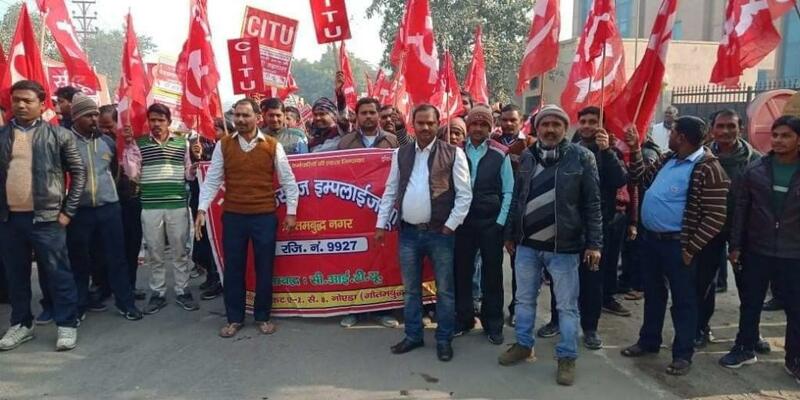 The historic two-day strike will continue tomorrow, January 9, with more and more workers from the organised and unorganised sectors expected to pour in. With a sea of red flags marching in the streets of various cities across the country, workers from various sectors are coming together to fight for their rights, while farmers and agricultural workers along with students and youth stand in solidarity with the striking workers. On the first day of the two-day nationwide strike, history is being scripted by the working class of the country. The strike will continue tomorrow, January 9, with more and more from the organised and unorganised sectors are expected to pour in. Workers on their way to the Cochin Export Processing Zone and at the Cochin Port were stopped by the protesters. All university examinations slated for the day have been postponed and educational institutions were also closed. However, private vehicles were seen plying. pilgrims to Sabarimala have also been allowed to proceed from all places. 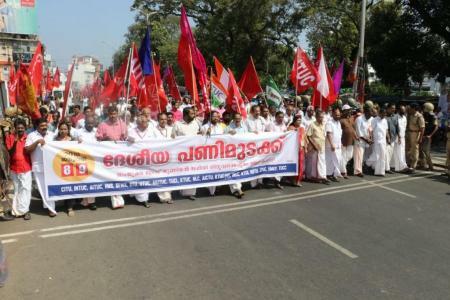 Senior CPI-M Rajya Sabha member and veteran trade union leader Elamaram Kareem told the media that the two day protest was in total in Kerala. 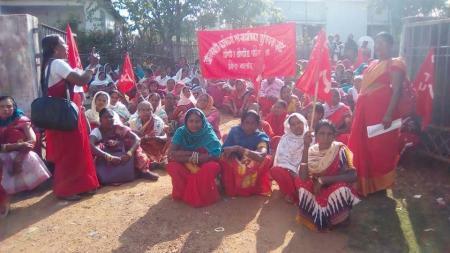 "The labourers at all the estates in the state are on strike. This is a protest against the wrong policies of the Centre and it should not be confused to that of a shutdown (hartal)," said Kareem. The two-day nationwide strike received a mixed response in Tamil Nadu on Tuesday, said a senior leader of Labour Progressive Federation (LPF). 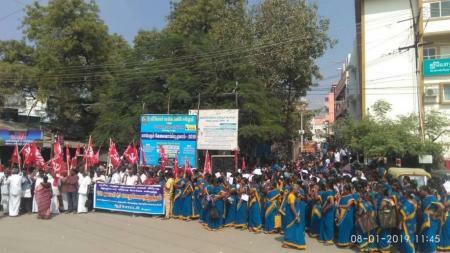 The response to the strike was positive from the unorganised sector like construction workers and others. "Members of our affiliated unions have not attended duty. Nearly 50 per cent of the bus services in Chennai are not plying. In other cities, about 30-40 per cent buses are on the roads operated by members of the ruling party union," said LPF General Secretary M. Shanmugam. Rail-blockades in many railway stations and sporadic incidents across West Bengal districts partially hit normal life as the two-day nationwide strike was observed across the state. Train services were disrupted both in Howrah and Sealdah division of the Eastern Railway and also South Eastern Railway. 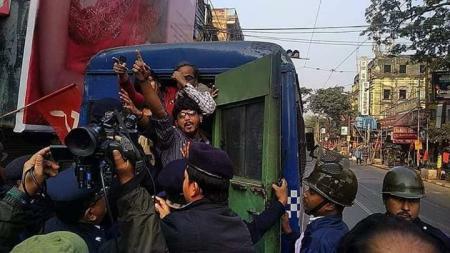 The strike supporters put up rail blockades and clashed with the police in many stations in the suburbs in South 24 Parganas district's Lakhikantapur and Canning; North 24 Parganas’s Madhyagram, Hasnabad and Barasat. However, reports said that Trinamool Congress (TMC) members attacked the protesting workers and trade union leaders in several parts of the state. The state police resorted to lathi charge in Asansol. Trade union leaders including CITU state secretary Anadi Sahu have been arrested in Kolkata. A number of senior Left leaders including CPI(M)'s Sujan Chakraborty were detained while picketing at various places in Kolkata. Left Front Chairman Biman Basu claimed that, "The Trinamool Congress government in Bengal would not allow any voice of protest against the Narendra Modi government's anti-people policies. Trinamool and the BJP pretend to oppose each other on the outside, but internally they have a nexus. The state government is actually backing the atrocities of the Modi government by opposing the strike." In the industrial areas across the country, including - the industrial areas of NCR Delhi; 24 Parganas, Hooghly and Howrah districts of West Bengal; the oil refineries across Assam; Pune, Nashik and Aurangabad industrial areas in Maharashtra; the industrial areas in Bengaluru, Mysore, etc. 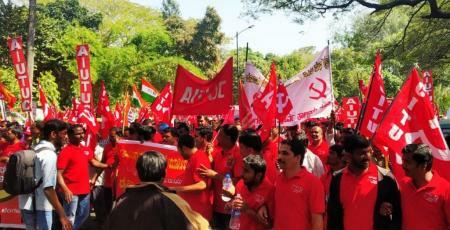 in Karnataka; Ludhiana in Punjab; Bokaro, Ranchi, Adityapur Gamharia industrial areas in Jharkhand; the engineering clusters in Baroda, Surat, Bhavnagar, Rajkot, Junagarh and Ahmedabad in Gujarat; and the industrial clusters in Hyderabad and surrounding districts in Telengana, etc.- the strike was highly visible.